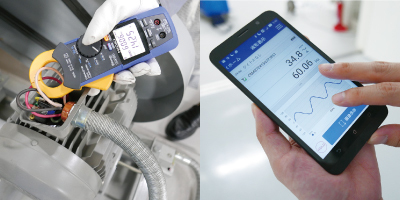 What could you do if it were possible to connect field measuring instruments to a smartphone or tablet? Do you think you’d only be able to send and receive measured values? With the GENNECT Cross app from Hioki , you can view waveforms with a field measuring instrument, in effect using it as an oscilloscope. You can also place measured values on site photographs to create intuitive reports in a flash. These days, field measuring instruments can do more than just output values. These capable partners can work with you to safeguard the sites you’re measuring. *The name GENNECT was coined from the Japanese word for “field” (genba) and the English word connect. GENNECT Cross is an app that connects field measuring instruments to a smartphone or tablet via Bluetooth® communications. More than just a tool for displaying and recording measured values, the app delivers new functionality that’s been engineered specifically to play a useful role in the field. For example, clamp ammeters used to generate only current values. By using GENNECT Cross, you can display current waveforms on a smartphone or tablet. Until now, you had to bring equipment like an oscilloscope or recorder to sites in the field because a standard, portable clamp ammeter wasn’t capable of displaying waveforms. GENNECT Cross’s functionality goes even further than that. The app provides robust support for work in the field with a multitalented array of functionality, including capabilities that let you use field measuring instruments as a logger and overlay illuminance measured values on floor plans. With GENNECT Cross, you pair instruments with the app easily, even if you don’t know anything about Bluetooth® communications. To connect an instrument at first, simply display the app’s pairing settings screen and turn on the instrument. That’s all you need to do to complete the connection; no other steps are required. Once an instrument has been registered with GENNECT Cross, it will pair automatically next time, eliminating the need for you to manually connect your device. 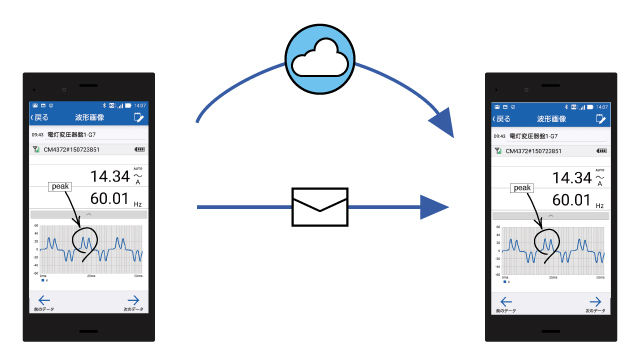 GENNECT Cross can share measurement data via e-mail or the cloud. You’ve probably had the experience of being unable to adequately describe what’s happening in the field over the phone. By sharing field data in the form of measured values, waveform data, photographs, and other information with GENNECT Cross, you can communicate the now of a site in the field more efficiently than ever before. Hioki measuring instruments have evolved over time as the company strives to create products that can be used with peace of mind, even in the harsh environments often encountered in the field. That evolution has delivered improved ruggedness, durability, and reliability, inspiring praise from customers. The sophisticated level of basic performance offered by Hioki instruments makes possible the functionality provided by GENNECT Cross. Going forward, the app will continue to drive the evolution of field measuring instruments.